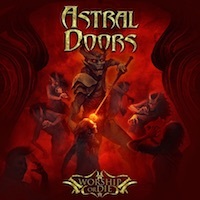 Worship or Die is the message from Astral Doors, the Swedish heavy metal band that has been around for quite a while now and has several albums in their discography. Their latest one is reddish and has a devilish heavy metal-styled artwork that might not fully represent Astral Doors’ style but it looks kind of cool. But is it a cool or good album? Many compare the band with the likes of Rainbow, Dio, Black Sabbath and more and I know that I have probably made the same comparison when I have written about the band’s previous works – albums that has been given ratings in the middle of our scale for the most part, there has been an exception of few to this but mostly it has been four points. Some claim that the singer sounds like the late Ronnie James Dio and that is probably not a bad comparison, a weaker and older Dio with less vocal range in my view. Quite powerful sound and strong production can be said about the album that has a dozen tracks with pretty good variation over an album that also feels okay in terms of playing time. In terms of style it is classically styled heavy metal and they sound like they have done for most of their career, perhaps that they are a little bit heavier and with a little bit more depth nowadays. The vocalist is their weak point, I have thought so about most of the albums I have heard, it is not personality in the vocals and he sounds a bit like Mr Herbert in Family Guy, at least that is something that keeps popping into my head when listening to this album. I think this album is mostly excellent and I keep thinking about what an amazing heavy metal album it would have been had the vocals been good, or at least less weak than they are here. Desperado also kind of ruins it for me, the vocals makes me skip this song every time I listen to this album. But there are some amazing tracks as well, like Night of the Hunter, what a great track and Marathon is another one I really like. Mostly I can overlook the poor vocals because the album is so good and most of the songs are very strong with one or two exceptions. Fans of Astral Doors will recognise their favourites and they will enjoy the album, and I think the same can be said for general heavy metal fans. An album worth checking out, had it not been for the weak vocals it would have been one of the best heavy metal albums I have heard – but it isn’t, it is only great. I think that this could be the best album by Astral Doors to date, really strong, really good and quite impressive songs by Mr Herbert and his band.